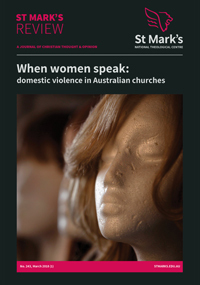 This issue explores what Australian churches make of the public conversation on domestic violence. Features articles from a wide variety of thinkers, including ABC reporter Julia Baird. ABC reporters Julia Baird and Haley Gleeson have found a central, recurring paradox during their year-long investigation: “Women suffering domestic abuse in religious communities say their faith has sustained them but their leaders have failed them”. This issue of St Mark’s Review explores what Australian churches make of the public conversation, what lessons have been learnt, and where we could go from here. Features articles from a wide variety of thinkers on the subject, including ABC reporter Julia Baird.